KUALA LUMPUR: Malaysian Resources Corp Bhd's (MRCB) ex-CEO, Datuk Mohamed Razeek Md Hussain Maricar, will be joining DRB-Hicom as one of its chief operating officers, with a focus on revitalising the company's property division, according to sources familiar with the matter. 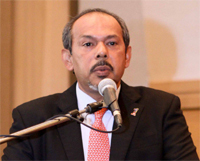 It is understood that his role in DRB-Hicom will be to unlock values in the group's vast land banks. DRB-Hicom alone has many parcels of yet-to-be developed land. Aside from that, the group's jointly controlled entity, Pos Malaysia Bhd, and subsidiary Proton Holdings Bhd also have a lot of land that holds potential for development. “In actual fact, DRB-Hicom has a lot more land to be developed compared with MRCB. So his role here is going to be significant,” said an insider. A local business daily had recently reported that Razeek would take on a senior role in DRB-Hicom, likely to head its property division. “Razeek's past experiences will endear him to companies such as DRB. More so his experience as an engineer and recognised by the Institute of Engineers Malaysia (IEM) will fit into the bigger picture where DRB is known for its engineering capabilities,” said an industry source. Razeek, 55 this year, had been on the board as the CEO of MRCB from December 2009. Before his stint as its CEO, he was the chief operating officer in June 2009 before being promoted thereafter in December. He is a qualified civil engineer and is also a member of the IEM, having graduated from the University of The South Bank in the UK. Razeek had worked in an engineering consultant firm in the UK in the 1970s. Thereafter he returned to KL in the 1980s to join a local engineering consulting company. After his stint there, he was also involved with other locally-listed property companies and had been the executive director with Land & General Bhd back in 1999 and as the project director with Eastern & Oriental Property Development Bhd. Just before his work with MRCB, he was the senior vice president of Dubai-based Damac Properties Co for about a year.